What is the longest beach that you have set your foot on? Before the 90 mile beach it was the 7 mile beach down the South Coast of NSW. But after visiting the 90 mile beach, it makes the 7 mile beach looks tiny. If you know other longer beach let me know. I'm not sure if this is the longest beach in the world or not. I have to Google that, but if there something out there in the world that's longer I will like to see it. Had googled it and the winner goes to Praia do Cassino Beach, Brazil. It stands in at 150 mile long. That's really long. But 90 mile beach is up there in the ranking. It is certainly the longest beach in Australia. If you are an Australian, then you own it to yourself to visit this beach and be in awe of the beauty of our nation. When I was at the beach I could not see the shore, I though to myself at the time this probably one of the longest beach in the world. And I was right and I'm glad I have make this trip. 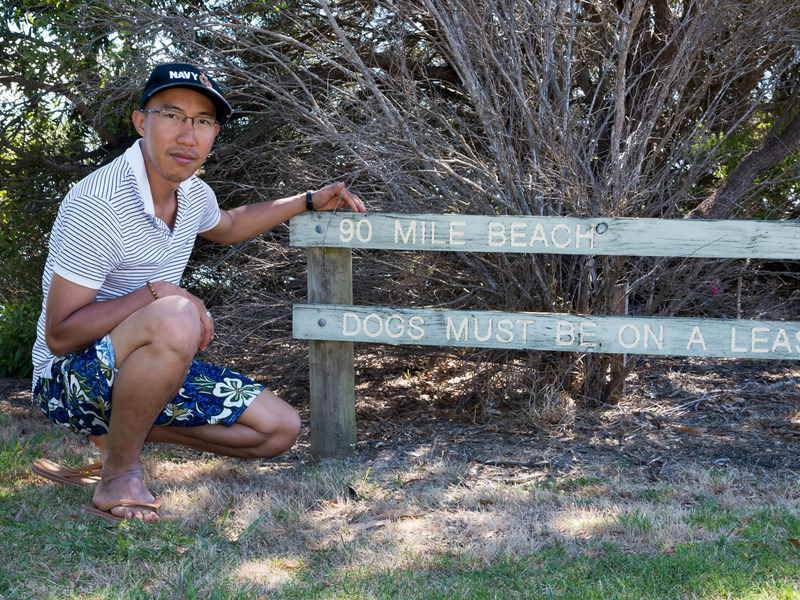 Below is a photo of me at the sign to the beach. It takes you another 20-30 minutes walk to get to the beach from this location. But it worth it, trust me. I need to post more photo of me in some of the shot, so you know I was there and it also act as a photo daily of myself. Hope you don't mind it.